I found myself drawn to this Radiant by Traer Scott, having grown up on an organic subsistence farm long before most even knew there was such a thing. (I blame my mother!) 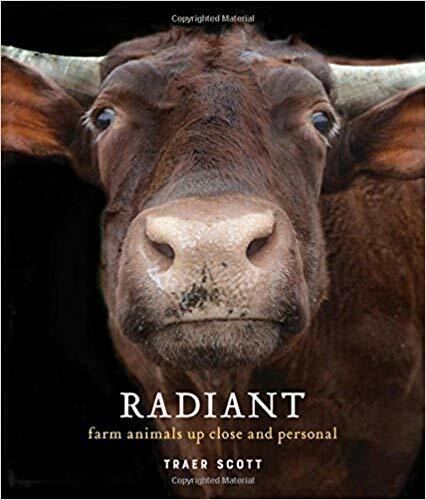 For many, Scott’s book will be an eye-opening book to the inner life of farm animals, for me it was a nostalgic reminder of all the unique personalities that critters on our farm displayed. I’ll never forget trying to convince pigs to move in a specific direction; they were more attracted by lying in the cool water of a stream or rooting in the mud or pasture. And they were too danged smart by half! Scott catches all that insouciance in his many pictures of our porcine friends and his description of the various breeds he portrays. Scott’s photographs are graced by curious cows, attitudinal alpacas, diminutive donkeys, garrulous goats, cantankerous chickens, and much, much more. In all his pictures, the personality and presence of these animals is accented and celebrated. I find myself thinking that all this nostalgic knowledge is why families find themselves drawn to petting zoos; we have lost a vital connection to the animals that accompany us on our stay on this planet. While we benefit from their existence, they are relegated to factory farms that most of us will never see or even consider. Scott’s photographs are a vicarious journey through the characters on a farm. Each picture is accompanied with some facts about the breed and a brief biography of the specific animal pictured. These animals live in sanctuaries, some born there, but many more rescued from abusive conditions. In addition, the introduction of the book includes facts about how farm animals have personalities just as their domestic cousins such as dogs and cats do and an overview of animal husbandry in its present form as factory farms. (While not all farms are factory farms, the vast majority of meat produced comes from them.) This overview contains facts about the factory farm’s impact on the environment, on the animals so raised, etc. Scott also includes additional information about different animals that he encountered on his journey to capture all these animals in photos, and the peace and contentment that he found when encountering these characters in sanctuaries. It is a brief glimpse into his pilgrimage that could stand as a book in its own right if it were expanded. As someone raised on a farm, I do wish Scott had included pictures of some of these animals in their first days of life. For instance, while I consider adult pigs rather homely, baby pigs are some of the very cutest beings on the planet. You just want to hold and cuddle them as they nuzzle and wiggle, and they’re just as smart and trainable as their parents, while being way more cuddly. Another baby/parent paradox is the Muscovy duck; while their head’s red bare flesh makes them one of the least attractive ducks, their chicks are the most adorable of all the duck breeds that we raised, incredibly yellow and fluffy. I also would have liked to see some of the breeds that we felt had outstanding personalities along with unique beauty, such as Indian Runner ducks and crested bantam chickens. But I guess I want all that because Scott’s beautiful photographs remind me of all the beauty and personality of the animals on our farm. And nostalgia for a time when our handful of cows had a hundred acres to roam, as did our chickens, ducks, and other livestock, is not a bad thing. While we benefited from their eggs, milk, etc., and even their manure, they were a cared for and respected part our family farm and were left to freely range as they would through meadows, woods, pond, and streams. I wish all farm animals had that freedom. Highly recommended for those who love farms, animals, or who want an eye-open gaze into the personalities of animals we take for granted and yet so many of us never see or touch in person. Scott’s book is a reminder that we owe these animals that we bring into existence the respect and care they deserve. Gregarious or shy, curious or placid, playful or retiring, all the animals in Traer Scott’s newest collection have one thing in common: a sparkling personality! This whimsical, soulful, and personal photo collection focuses on the lives of the farm animals we often take for granted. Scott introduces us to barnyard animals both familiar and lesser known, from cows, pigs, sheep, and chickens to Dolly the wooly llama, Bianca the Sicilian miniature donkey, Percy the Indian peafowl, and Justice the yak. Some of the animals are kept as pets; others are denizens of farm sanctuaries that Scott has visited. She shares her anecdotes about a Texas longhorn steer whose best friends are a trio of goats, a turkey who likes to snack on grapes and watermelon, and many others. Lively captions provide information on each breed, to round out this enchanting tribute to our four-legged (and winged) friends from the farm.